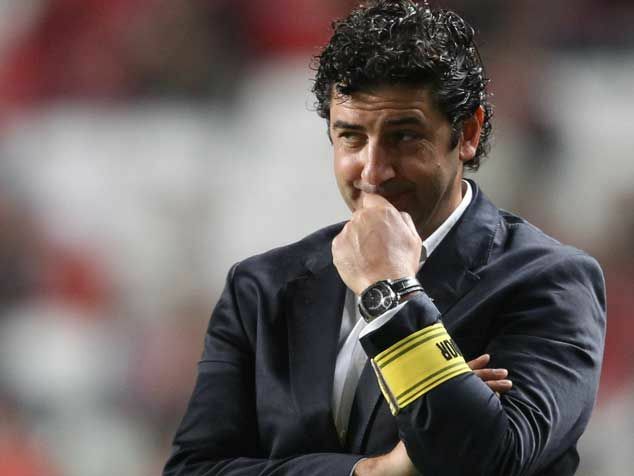 Vitoria Guimaraes have been excellent under head coach Rui Vitoria, and currently find themselves at 3rd in the league. It was an interesting week in Portuguese Football with the Big 3 in action. Porto kept pace with Benfica and Sporting had a rough game that ended their unbeaten run. Definitely many a headline made by the Tres Grandes in the English press, so let’s round-up the week’s news. The Liga weekend was bookended by wonder goals as the Big 3 battled in the standings, first up was Benfica who was taking on Rio Ave at the Luz. It was a feisty game as Rio Ave has been quite impressive early on with a 4 game unbeaten run to start before they came down to earth. Much maligned Liga scoring leader Talisca took the game by the horns in the 60th minute with a monster goal from 25 yards out that curled past Cassio (who was on fire throughout for Rio Ave) into the back of the net to give the Eagles a lead they would not relinquish. Rio Ave came close but a greedy run from Rio Ave man Esmael had him one stride offside before scoring and by the time the linesman looked up he was a full 3 strides off. Shame as it was a great run but he should’ve checked it and they would’ve had a memorable goal at the Luz. In the end Talisca has 8 goals to lead the Liga in scoring and Benfica ensured their lead atop of the table would be maintained. Sporting was up next with a trip to the Estadio Dom Afonso to take on Vitoria Guimares and it was a horrible match for the Lions as VG continued their superb form with a convincing 3-0 win at home. The rout started early as Sare potted a goal on the 15 minute mark to give the home side the lead. That was followed before half time with an own goal by Sporting CB Mauricio who was trying to divert a Joao Afonso header that was goal bound. This gave Guimaraes a two goal lead heading into the second half and they were bang for the buck as they out chanced Marco Silva’s men in the second half and it culminated in Cedric bringing down Andre Andre in the box and double Andre was then forced to convert from the spot to make it an emphatic 3-0 win over the Lisbon giants. Something has to be done about the Sporting backline as their swashbuckling attack that is highly entertaining will have matches where the goals dry up. Mauricio instead of focusing on transfer talk with Manchester United should concentrate on his defensive play, as no one in Europe is going to want him the way he leaks goals. Unfortunately Sporting dropped in the standings because of this major faux pas and their unbeaten Liga run evaporated leaving Porto as the only unbeaten side in the Primeira Liga. Last up was Porto who was at home in the Estadio do Dragao to face Nacional who is near the bottom of the Liga table. The Blue & White put on a clinic easily dispatching their counterparts 2-0 to close to within one point of league leaders Benfica. The lead came early for Porto as Danilo from a narrow angle smashed a shot past Rui Silva, in goal for Nacional, giving the Dragons the lead in the 9th minute. It was a lead that Porto never looked like they would relinquish, Jackson Martinez had many opportunities to tie Talisca at the top of the scoring lead, and the Porto beast came close on multiple occasions. In the end it was left to Brahimi to score a stunning top corner goallasso to secure the win for Porto in the 74th minute. What a revelation Brahimi has been for Julien Lopetegui’s squad easily one of the best players in the Liga this season, if not the best. This kept Porto in pace with the league leaders and promises to make this season one of the most memorable ones in recent history, with both Benfica & Porto in form. Brahimi the beast was already getting a lot of interest from abroad before his wonder goal for Porto, I expect to see many more calls for the Algerian wing machine. Fortunately for Porto and Liga fans Brahimi declared his commitment to Porto. Danilo scored his goal for Porto this week on the back of being voted Porto’s best player of the Year. Porto’s Mexican midfielder, Hector Herrera, made headlines with Manchester City expressing interest in the Mexican International. Talk also surfaced that Newcastle’s Striker Ayoze Perez almost joined Porto in the summer, the exciting young Spaniard said he came very close to signing for Porto. This led into news headings of this week’s Champions League game with Bilbao. Hopefully Porto can dispatch the spunky Spaniards to maintain their road to the next round. Enzo Perez has been a beast in Benfica’s midfield for a few seasons now so his departure will come soon. Talk of Manchester United meeting the World Cup stars buyout clause made news this week although Valencia look to beat out Man U to the Argentine man. Also much was made of Chelsea and Manchester United’s interest in Jesus throw-away Andre Gomes who is lighting up La Liga with his play. The Portuguese International is much coveted by many Managers that have an appreciation for his talent. Gaitan also is set to sign a new deal with Benfica with clubs like Liverpool, Man United, and Man City in a chase to get the Argentine International. Salvio too has been generating a lot of interest as Inter has joined a group interested in taking the marauding Argentine winger to Italy. Benfica also showed interest in Sergio Aguero‘s brother Gaston del Castillo who is only 17 but is already said to be followed by a number of European teams. There was also a lot of chatter on their interest in Manchester United’s back-up Goalkeeper Anders Lindegaard some think it could be a part package for players such as Enzo or Gaitan. Also Jesus made a lot of headlines as he thought he should’ve been on FIFA’s shortlist for Coach of the Year. To be fair to FIFA when you lose so many big games, you tend to get overlooked. Coaches of the year do not tank in the Champions League. Much of the talk surrounded Nani as many think he will get a second chance next season after his early season form. Nani was awarded best player so far this season in the Liga. Although Nani says he has no interest in returning to Man U. At the moment Manchester United own the best player in Portugal. Cedric was also being pursued by Arsenal and Everton, as they look to Cedric to improve their fullback options, but reports suggest that he will reject a move away from the Alvalade although his agent says he could be on the move in January. Slimani also gained some interest as Everton looks to add him to their line-up. Sporting was also eyeing up Gremio Defender Pedro Geromel the former Vitoria Guimaraes player, hopefully they do as they need a lot of help in defense. Let’s hope that Sporting can get back on track this week and they can start with the Champions League where they take on Schalke and hopefully this time they can get a Referee that doesn’t require a guide dog to officiate the match. Once again it was another interesting week with many headings that had fans talking about Portuguese Football, follow us on twitter as we post links to late breaking news on a daily basis.